Mohamed Mustafa ElBaradei (Arabic: محمد مصطفى البرادعى‎, Muḥammad Muṣṭafā al-Barādaʿī, Egyptian Arabic pronunciation: [mæˈħæmmæd mosˈtˤɑfɑ (ʔe)lbæˈɾædʕi]; born 17 Juin 1942) is an Egyptian law scholar an diplomat who wis the actin Vice Preses o Egyp syne 14 Julie 2013 till 14 August 2013 . He wis the Director General o the Internaitional Atomic Energy Agency (IAEA), an intergovrenmental organization unner the auspices o the Unitit Naitions, frae 1997 tae 2009. He an the IAEA wur jyntly awairdit the Nobel Peace Prize in 2005. ElBaradei wis an aa an important figure in recent politics in Egyp, parteecularly the 2011 revolution which oosted Preses Hosni Mubarak, an in the 2013 protests an militar coup that toppled Preses Mohamed Morsi. ↑ Jahn, George (30 November 2009), “Outgoing IAEA chief leaves complex legacy,” Associated Press, Retrieved 5 February 2011 on msnbc.com. ElBaradei, who describes himself as having a Muslim background, sometimes cites his favorite Christian prayer when speaking of his role on the world stage. ↑ "History – Muslim Public Affairs Council (October 2006: MPAC presents inaugural "Human Security Award" to Nobel Peace Prize winner Dr. Mohamed ElBaradei, head of the International Atomic Energy Agency.)". Muslim Public Affairs Council. Retrieved 5 February 2011. 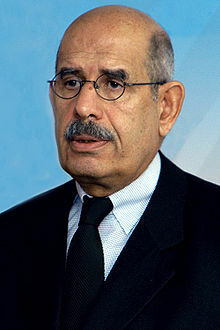 "Mohamed ElBaradei collectit news an commentary". The Guardian.